Disclosure: I received complimentary Doodle Pants to facilitate this review; all opinions expressed are my own. As Grayson nears 2 years old (he just turned 21 months on Sunday - GAH! ), I'm remembering how opinionated that age is, and lately he's getting plenty of practice! 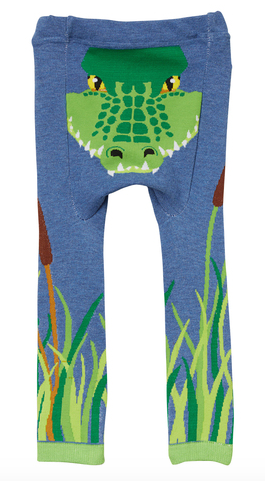 We were recently introduced to Doodle Pants, a New England-based company which makes the most adorable leggings for babies and toddlers. These aren't regular leggings - they have bright motifs full of personality that your little one will be excited to wear (and you might wish they were in your size too!). When Grayson received his Blue Alligator Doodle Pants I held them up to show him the back, and he immediately started growling - that's his automatic sound for any animal lately! With Grayson's 5 year old big sister Nia I consider myself a leggings connoisseur - we run through them pretty quickly especially due to her getting constant holes in the knees. 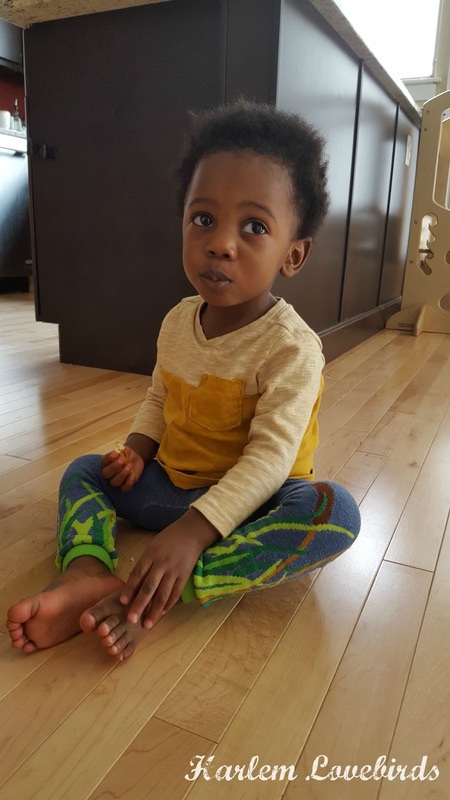 The true test for me was how Doodle Pants would hold up out and about as well as at home where Grayson tumbles and scoots around all day. We've taken our Doodle Pants to Play Fair in NYC and have worn them to the playground as well as the very active story time at our local library. Through all of our outings and repeat washings our Doodle Pants have held up remarkably well! Doodle Pants are thicker than leggings we're used to - they're more like tights, and after over a month of wear we haven't experienced any holes, thinning or tearing. My hightest test of quality? 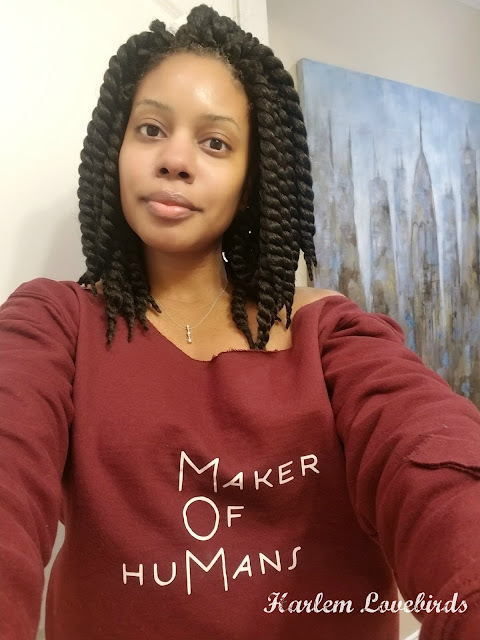 : the colors remain vibrant! 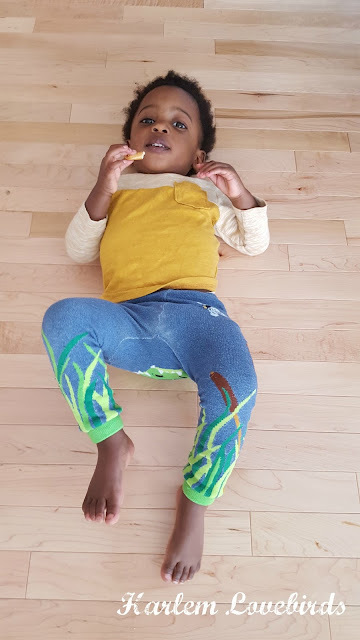 This winter I liked pairing Grayson's Doodle Pants with his Robeez furry boots and when Mr. Lovebird would see him in his ensemble he'd ask, "You have my son in leggings and Uggs???" and I'd have to explain, "Nooooo, these are Doodle Pants - he's making a fashion statement!" 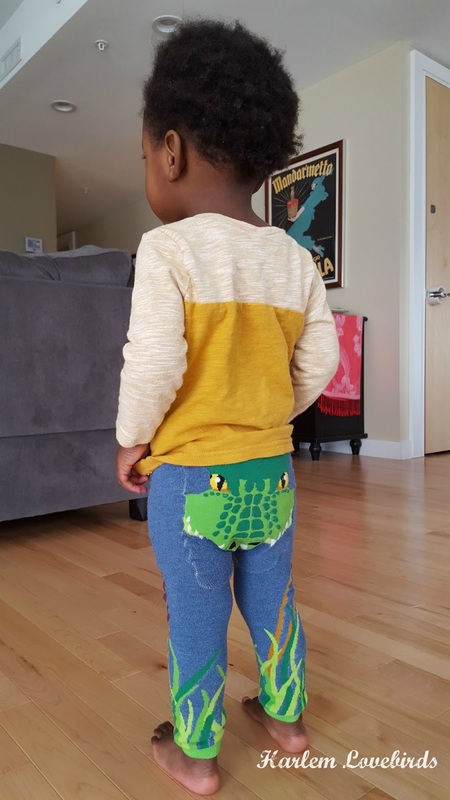 Grayson's on board 100%: when I pull his Doodle Pants out of his drawer he smiles and asks to see the alligator on the back. And of course he growls! I never knew he'd be so into his outfits, and I love seeing how his face lights up. As temperatures are now in the 40s up here in New Hampshire, I find Doodle Pants make a great seasonal transition staple. They're thick enough to keep out the chill without making Grayson overheat - he's one warm-blooded little guy! 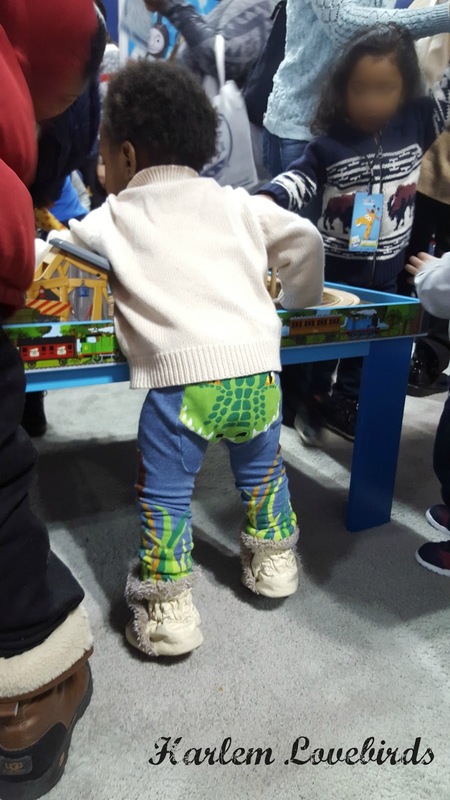 Doodle Pants are also a great conversation starter: we get asked about them by other parents every time he wears them out and about. Doodle Pants also carries bodysuits, hoodies, dresses and hooded towels all featuring fun, quirky prints. A quick tip when shopping on the website: check out both the girls' and boys' categories as there are cute gender neutral options in each! 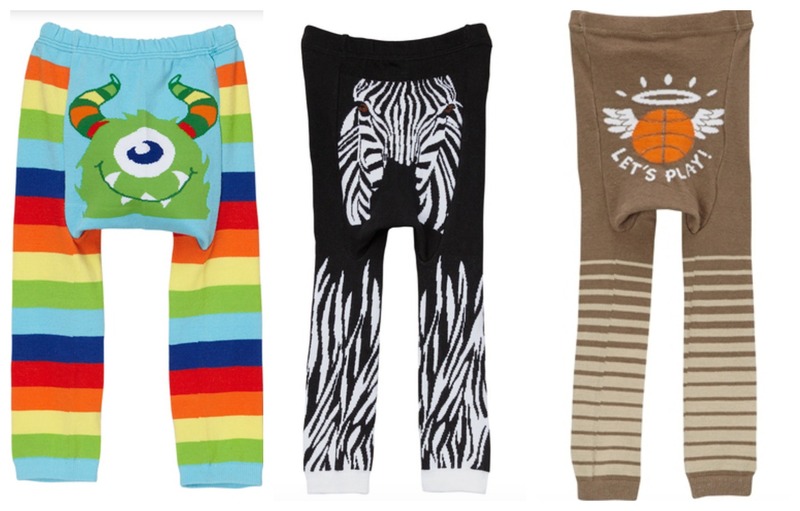 You can shop Doodle Pants on their website, and be sure to follow Facebook and Twitter for their latest news and promotions - you get 15% off when you sign up for their email newsletter! 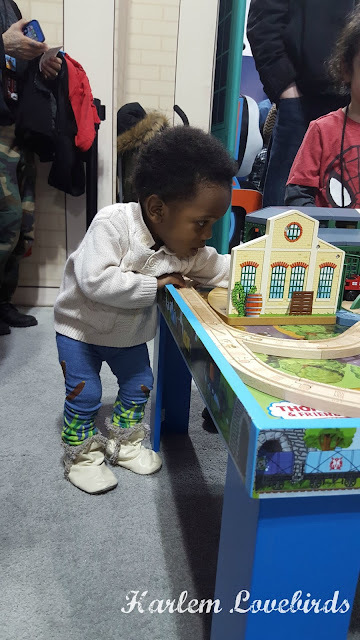 At what age did your little one start sharing fashion opinions with you?